The case involving former billionaire Seán Quinn's children, the Irish Bank Resolution Corporation (IBRC) and its liquidator has all the trappings of a high-stakes legal battle. A veritable army of lawyers are involved. The parties are represented by three high-powered law firms and there are so many senior counsel - eight in total - that there is not enough room for them all on the senior benches. The trial, ongoing for a fortnight, could last six months. At issue is the validity of guarantees and share pledges given by the children in connection with multi-million euro loans from IBRC's predecessor, Anglo Irish Bank. The case is not just notable for what is at stake, the plethora of lawyers and its expected length. It also involves a considerable amount of intrigue. In the past week, the High Court has heard allegations of serious fraud, arson and violence. The judge has twice been told some witnesses are reluctant to participate. There has also been conflicting claims about the dynamic that existed within what was Ireland's richest family. 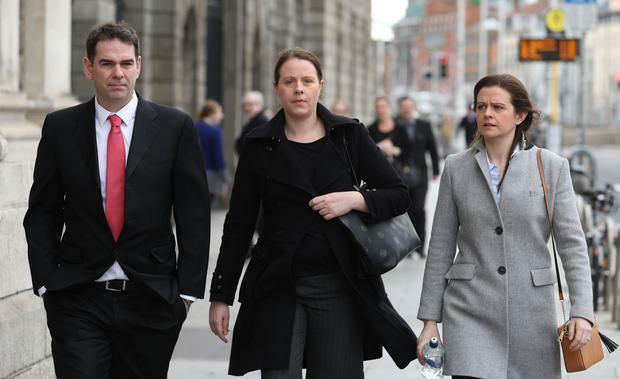 Bernard Dunleavy SC, counsel for Seán Jr, Ciara, Colette, Aoife and Brenda Quinn, said they lived modest lifestyles and did not fully grasp the implications when, at their father's behest, they signed the guarantees and pledges. It was claimed that although the children were the shareholders in Quinn Group, they were under his influence and he made all of the decisions. But IBRC's counsel Paul Gallagher SC has rejected the presentation of the children as "naïve and unsophisticated". He said they were well-educated and used to engaging in complex, sophisticated multi-million euro transactions. According to Mr Gallagher, their lifestyles were anything but modest. The €1m wedding of Ciara Quinn was cited, as were gifts worth €12m from the children to their parents. The case has its roots in Seán Quinn's ill-fated use of contracts for difference (CFDs), financial instruments which allow someone to bet on the performance of a share without owning it. Huge profits could be made if the share price increases, but enormous losses can be suffered if it falls. Mr Quinn placed all his eggs in one basket, speculating on the performance of Anglo. As the share price collapsed during 2007 and 2008, some €2.34bn was borrowed by Quinn companies from Anglo. The lending had the dual purpose of funding Mr Quinn's losses and of propping up the bank's share price. The CFD stake would ultimately be unwound, but this could not prevent the collapse of Anglo or the Quinn family losing control of its business empire. Mr Quinn was adjudicated bankrupt in 2012. While this wiped out his debts, his children have been pursued by IBRC for a liability of €415m arising from the Anglo loans. They argue they should not be held liable as they were unduly influenced by their father. An interesting feature of the case is they are not suing their father, but the bank. They say Anglo knew the influence their father had over them and claim the bank was negligent and didn't tell them to get independent legal advice. As part of IBRC's defence, it has drawn attention to an alleged scheme to put up to €455m in foreign property assets beyond IBRC's reach. Mr Gallagher said the children knew where the assets were and decided to remove them. He said this involved "deviousness" and "malintent". The court has been told the first five witnesses to be called will be the Quinn children. Brenda Quinn had been due to be examined yesterday, but this was delayed due to a number of applications. The court heard the calling of witnesses has not been straightforward. Handing in a list of 20 intended witnesses, Mr Dunleavy said some were reluctant to give evidence. Earlier in the week, barrister Ross Gorman told the court of threats and actions of violence towards two witnesses he represents, former Quinn Group executives Dara O'Reilly and Liam McCaffrey. Mr O'Reilly's car was set on fire and boiling water was thrown in his face. The case will resume on Wednesday when Mr Justice Garrett Simons will rule on whether the children can pursue their allegation that their father unduly influenced them. The judge will also decide whether they can be quizzed about the alleged conspiracy to put property assets beyond IBRC's reach.